For those of you that already know me, glad you are here. For those that do not know me, welcome. I have been working on a homepage for about a year now, but due to crashing systems, lack of time, and some other factors I haven't been able to put one up sooner. I always wanted to build my own, to make my presence known on the Net ever since I first started surfing. My friends sometimes call on me when they have a problem with their "puter" , and through doing things wrong, and simply experimenting I came to be a bit of a computer "tech". So now then, finally it has happened. My homepage is (somewhat) finished, and up and running on the internet. A miracle of its own! Aside from what I told you on the top of this page , I like to tinker with computers and software. I have gathered a quite nice collection of software over the few years I've been working in and with computers. When you sell computers and software, the manufacturers do sometimes give you certain products for free, or a very small amount. And when I got myself my first computer, I was "hooked". This page is also a result of my hobby. As you may have guessed from the first page, I am also a Christian, since may 1997 to be exact. How and why ? check out the page titled : Why Jesus? Reading is also a favorite pastime for me. the books by Tolkien have always been favorite, and also the Anne McAffrey books of "The dragons of Pern" always enjoyed me very much. Nowadays I do not read as often as I'd like to. But study, my wife, church and the children in the church, and the computer take up a lot of my time. I have also recently discovered Frank Peretti books. Even if you do not believe as he does, it still is exciting stuff. Then there's the Left Behind series.. also very gripping reading, biblical accuracy aside, and we recently got 2 books by Alton Gansky, very thrilling! We are proud servants of two lovely Siamese cats. (Didn't you know, a dogs got an owner, a cat employees!) They are a little bit of proof of Gods sense of humor. You've never seen cats able to act so silly! I'm planning to scan in a few photos, once I've made them, and putting them on this page too. This is us, after a day of celebrating, and being in the middle of something you are slightly aware of, but seems to have to do something with you! 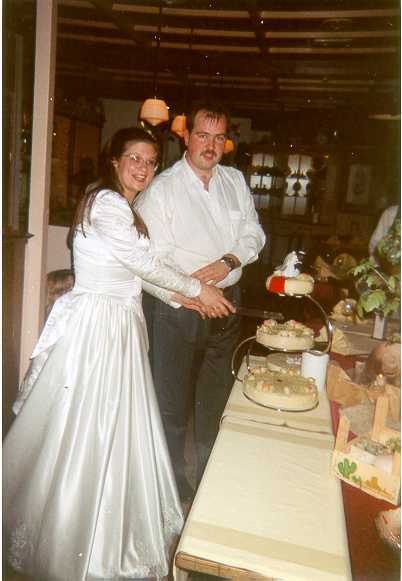 We had a dinner afterwards with family and some special friends, and as a desert, we had our wedding-cake. Ok so far this introduction to us. Hope you enjoyed it. If possible , come back and visit us again, for I'm hoping to update this page at least every year..